Replica depictions of Last Supper, Gethsemane, and other New Testament scenes. Forty "snow-white" statues of Jesus' life and ministry spread throughout a 3.5 acre park in the California desert. 23 statues depicting 14 scenes from the life of Jesus are spread throughout this date farm. Listen to audio narration for each scene on the website. Sculpture garden northeast of Sacramento, on the slopes of the Sierra Nevada foothills, featuring 20 characters and scenes from the Old and New Testaments. Biblically-inspired landscape art, with painted scriptural verses and a Sea of Galilee. Set on 15 acres, 11 miles from Walt Disney World, the Holy Land Experience describes itself as a "living biblical museum," with numerous exhibits and theatre productions. For example, there is a floor model of Jerusalem c. 66 AD, "the largest indoor replica in the world"; Herod's Temple on Mount Moriah; and, the Garden Tomb. The park also hosts "The Scriptorium: Center for Biblical Antiquities." Built on the 20 acre property of an evangelical church, the worship center features replicas of Jesus' tomb, Jacob's well, Sea of Galilee, and garden flora of date palms, olive trees, grape harbors, fig trees, almond trees, and mustard plants. A one hour drive southwest of Atlanta, the Center (formerly Explorations in Antiquities Center) gathers various Holy Land sites and scenes. A large focus is on elements of everyday life, including a goat hair tent, olive press, tombs, and vineyards. A gallery showcases over 200 "ancient artifacts," and visitors can schedule a "biblical meal" in rooms modeled after "ancient cities" from the first century. 198-foot cross at junction of I-70/I-57, surrounded at base by interactive 10 Commandment display. This "multi-media interactive, half-mile winding prayer trail" uses 40 "life-size" bronze sculptures to show Jesus' final days. Golf holes that invoke the Days of Creation, Noah's ark, Garden of Eden, Mt. Sinai, and the Star of Bethlehem. 2.5 acre attraction tucked away on the backside of a working class residential neighborhood. The main feature, a Garden Tomb replica, is complemented by a Sermon on the Mount statue and landscape materials from Israel-Palestine (e.g., stone from the Jordan River). The attraction affords a tremendous view of the Cincinnati skyline and is usually washed by the sound of I-75 passing traffic, which flows directly below the hilltop location. Biblical art in multiple media, including sculpture series on "Genesis, Song of Songs, Exodus, and Heroes." "A life long project to tell others about Jesus." The scale model includes The Jordan River, ruins of Jericho, a palace of Herod, and New Testament villages like Samaria and Galilee. Grotto-style art environment with depictions of Solomon's Porch, Adam and Eve, Daniel in the Lion's Den, Lazarus, and others. Chautauqua Lake acts as the Mediterranean Sea, and other natural features stand in for Mount Hermon, Dead Sea, Jordan River, Sea of Galilee, Mount Tabor, and the Mount of Olives. Replicas of Golgotha and the Garden Tomb and "the world's largest 10 Commandments." This "wax museum" uses 300+ "life-size" figurines to depict 70 biblical scenes. There are two main tours, one depicting Old Testament "miracles" and other New Testament scenes from the life of Jesus. Created by the Society of the Separatists of Zoar, a German communitarian group. 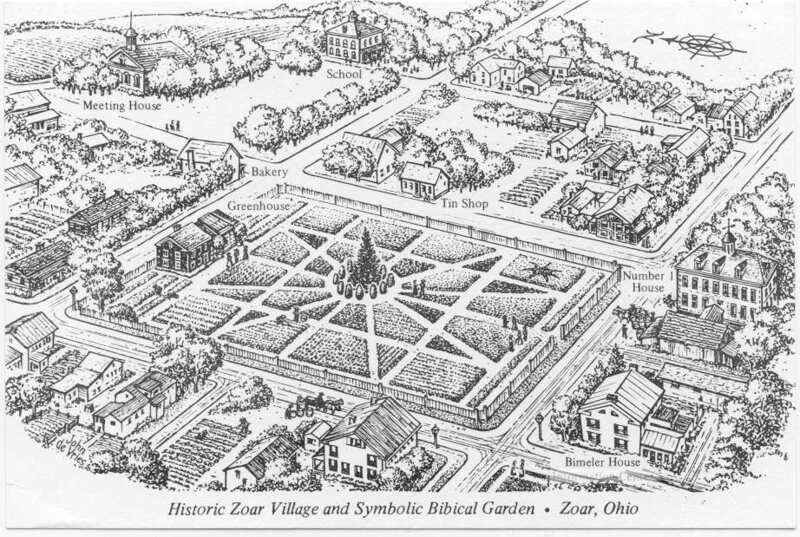 The village garden is inspired by Revelation 21 and represents the theological lesson of "many paths to Christ." A tall spruce tree in the center represents Jesus, while 12 surrounding trees represent the disciples. Today's garden reflects a restoration effort that began in 1960, after the original garden was dismantled in the 1920s to build tennis courts. Biblical art collection from famed American woodcarver. "Life-sized" wooden Last Supper sculpture. Set in the Smoky Mountains, this attraction features "incredibly lifelike scenes telling the Story of Christ." Free to the public and located inside an urban cemetery, the site features replications of biblical scenes. Museum exhibits "historical and contemporary works of art and interest that encourage study, appreciation, and discourse in regards to the evident role of Biblical themes in art history, the humanities, and world culture." In May 2015, the museum added a Stations of the Cross "sculpture garden." Multiple sculptures on site, including: Last Supper, Stations of the Cross, and others. Garden with replicas of the Western Wall, Calvary, Garden Tomb, Stations of the Gross, olive trees and vineyard. "A living map of the State of Israel," built in 1999, featuring replicas of the Western Wall and Masada. Children's building at Texas megachurch; this replication of Noah's Ark is 28,400 square feet and includes animatronic animals, wall murals, and other immersive features. 14-square foot floor model replica. Collection of sculptures includes re-creations from the Old Testament books of Job, Malachi, Daniel, and Ecclesiastes. All the work of one local craftsman, features hundreds of life-sized and miniature biblical scenes. "More of an adventure playground than a typical museum," experience a market and map of Paul's journey. Enter through "a gigantic ear"! 20 acre attraction is sponsored by "Bahamas Global Impact, Prayer and Fasting Network." A video documentary of the park's making by the founders explains: "It's biblical, it's ecological, it's geological!" City of Refuge will feature 49 Holy Land sites, including the Upper Room, Mt. of Olives, Garden of Gethsemane, and Jericho Road. This "exact replica" of Solomon's Temple was created by the neo-Pentecostal Universal Church of the Kingdom of God. Portions of the attraction were built using stones flown in from Israel and inside is a replica of the Ark of the Covenant. "Full-scale" replica of the ark on Ma Wan Island. The replica is part of a larger park with other attractions, and the ark's interior serves as a hotel and conference venue. 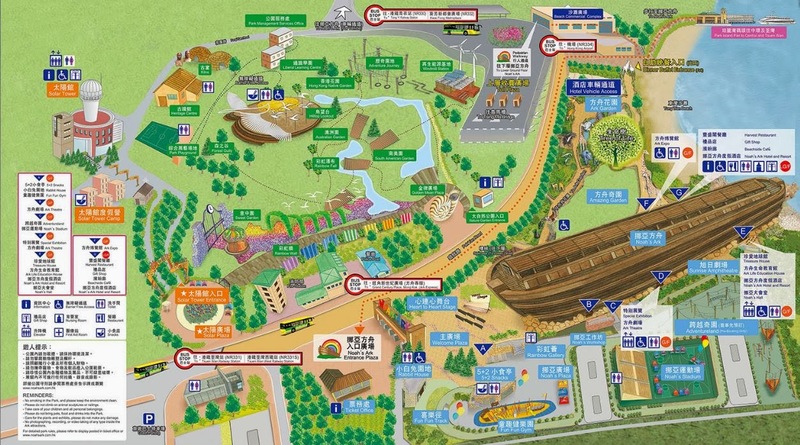 The park "aims to foster family values and teach love, social harmony and care for the environment." Sculpture garden featuring 32 characters from the Old Testament, New Testament, and Church tradition. Stones etched with Bible passages, models of biblical sites, stone crosses, and miniatures illustrating various parables. Art and botanicals on several themes: Creation, Garden of Eden, Old Testament, New Testament, Resurrection, and World Church. Collection of rock-hewn churches, modeled on city of Jerusalem and including several biblical replicas. ​Old and New Testament replicas. "Outdoor museum with the atmosphere of biblical Israel." Walking path of biblical replicas. Replicas of first century life. Replicas of first century life and biblical meals. A living history museum depicts the rural Nazareth of Jesus' youth, set amid contemporary Nazareth's urbanism. Attraction "features a carefully researched re-creation of Jesus' hometown. The original farm has been restored with olive trees, terraces, ancient wine press, irrigation system and stone quarry. Exact replicas of first century houses, synagogue, mikveh and olive presses have been carefully built using the same methods that would have been used by Joseph the carpenter." Located just north of Nazareth, this attraction re-creates everyday activities "just the way it was done in ancient times." Visitors dress in period clothing to make bread, oil, cheese, wine, and tend the flocks. A three-star hotel, located northwest of Jerusalem, features "a variety of biblical plants and trees as well as reconstructed buildings and agricultural tools from biblical times." Located in the Old City's Jewish quarter, the Institute is more pre-creation than re-creation. "The major focus of the Institute is its efforts towards the beginning of the actual rebuilding of the Holy Temple. Towards this end, the Institute has begun to restore and construct the sacred vessels for the service of the Holy Temple... They are made according to the exact specifications of the Bible, and have been constructed from the original source materials, such as gold, copper, silver and wood. These are authentic, accurate vessels, not merely replicas or models." At this attraction, visitors sail around the Sea of Galilee in a wooden boat, "an exact replica of the famous boats that played a key role in Jesus' life." The boats are modeled after a 1986 archaeological discovery of a "2000 year old" wooden boat in the Sea. Desert camping, biblical meals, workshops, and living history re-enactments. Mural art depicting biblical timeline, Genesis to Revelation. Stretches more than 100 yards in length. A replica on 200 square meters of land, built at the home of outsider artist Roberto Albertelli. Claims to include stones "taken secretly from the Golgotha." Features Ark of the Covenant replica and a Garden of Gesthemene statue series. 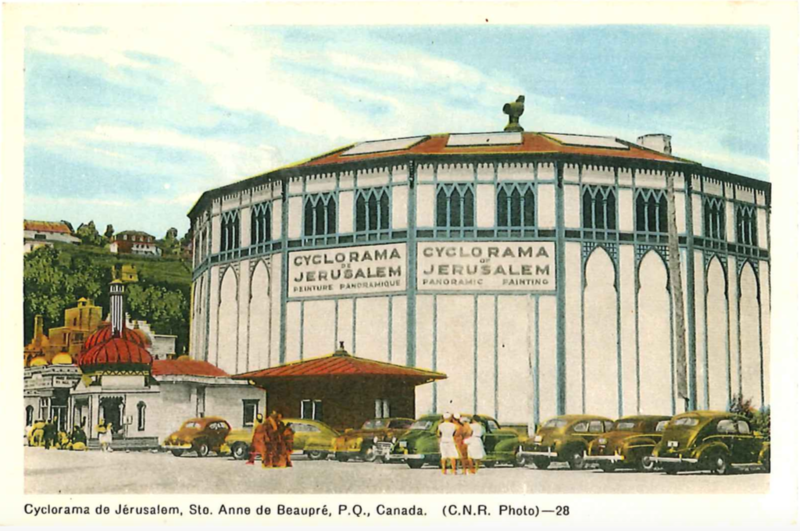 This Dutch attraction features various replicas of Jewish, Christian, and Muslim sites. The "museum" is both indoor and outdoor and is "as if walking through a different world." 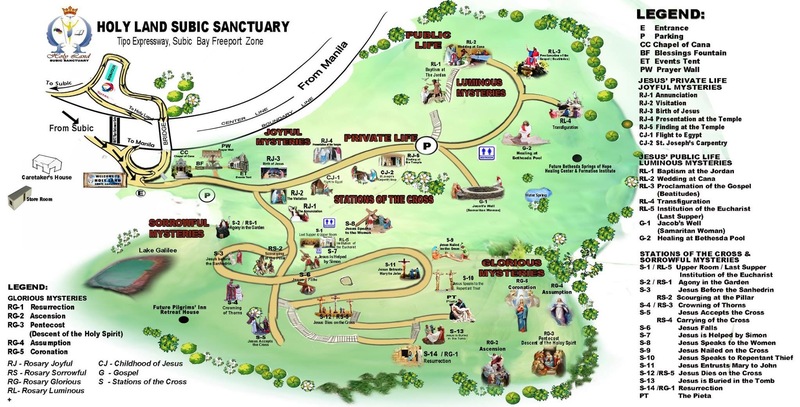 Located a four hour drive north of Manila, this Holy Land replica is one of three attractions in the Eco Park, alongside a science museum and "dinosaur island." Scenes include the Garden of Eden, Moses' exodus, Egyptian pyramids, and Jesus' "way of the cross." Installed in specially designed building for viewing, the circular painting measures 10 meters high and 100 meters long. Includes 30 meter panorama painting and over 450 wood-carved figures.